I failed in my previous McKinsey PEI - when can I re-apply? I failed in my previous McKinsey PEI – when can I re-apply? Finally it does not matter too much for McKinsey, if you failed because of your case interview performance, or because of your PEI performance. A reasonable time-frame to re-apply is usually 18-24 months. There obviously was a good reason, why McKinsey declined your application previously. As a consequence, you will just need a certain amount of time for yourself to improve your capabilities, so that in your next interviews you can meet the high McKinsey standards. Especially when thinking about the Personal Experience Interview in general, and about the dimensions Leadership and Persoanl Impact more specifically as soft-skill related dimensions, you will need to be exposed to new challenges … which just takes time. This oftenly goes along with changing your current job or progressing from university to full-time employment. If this is the case and you have strong intentions to re-apply with McKinsey, then you need to make sure you are choosing your new job based on those aspects which you actually need to improve! In any case, you will need some good justification at the time re-applying, why and how you improved meanwhile. As a basis for that, it’s always good to at least try to get as much information out from McKinsey about your performance, and more specifically where you need improvement. More often than not, McKinsey does not offer this feedback from their side, but pushing a little bit and being persistent in that direction oftenly pays off. And since anyway you are talking to McKinsey, you can also ask them about their opinion at which point in time you might want to re-apply! 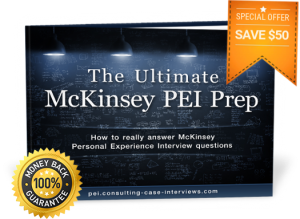 You can find much more information about the McKinsey PEI and how to really master it in The Ultimate McKinsey PEI Prep eBook! Previous Previous post: Can my McKinsey PEI examples come from experiences some years ago, related to work? Next Next post: Is it OK to re-position your McKinsey PEI stories, or better have new ones?